Your old favorite book is now your new favorite game! Draw a category card, grab a book, and then quickly skim to satisfy the chosen prompt (and the judge!) with the most entertaining phrase. Can you find "a ridiculous tabloid headline" in that best-selling novel? How about “dating advice” in your well-worn cookbook? Since you can use any book, you can play with any group and find limitless potential on every page! 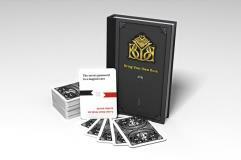 Where will you discover “the title of the next hit party game?” Find out when you Bring Your Own Book!